8215 B Old Oregon Inlet Road, Nags Head, NC.| MLS# 102631 | Outer Banks Homes For Sale, North Carolina Home Search Including Nags Head, Pirates Cove, Manteo, Kill Devil Hills Kitty Hawk, Southern Shores, Duck, and Corolla North Carolina, Oceanfront and Soundfront properties for sale and long term rentals. THIS OCEANFRONT PROPERTY IS JUST A TRUE RENTAL MACHINE. With over 5,100 square feet of living area and 10 bedrooms this beach home has room for the whole family and friends as well. Plenty for all to enjoy. Starting as you enter the ground level game room sporting a pool table, foosball table, 3 TVS and oh yes, can't forget the full size movie theater style popcorn machine. Also, for convenience is a refrigerator, stand alone ice maker and dishwasher for easy clean up after making all those frozen drinks after a hot summer day on the beach. Also on the ground floor there's 3 bedrooms/2.5 baths with the half bath also opening up to the outside for quick breaks from the pool or beach. The large laundry room is also located on the ground level with washer/dryer and dual hot water heaters. The convenience of the elevator makes all levels of the home easily accessible. The second level is the main resting area with 6 bedrooms/3 baths with two of the bedrooms opening up to the large 2nd level deck. The main entry foyer is also located on the 2nd level along with an additional stack washer/dryer for convenience. Upon approaching the 3rd level you'll find the large open living area with lots of cozy seating and updated kitchen with new granite countertops, tile/backsplash and microwave. Dual range/ovens, dishwashers and ample kitchen/counter space make meal time a fun time for all. Also fun for all is the large multiple milk shake mixer. Most of all you'll be mesmarized by the BREATH TAKING OCEAN VIEWS all overlooking the large pool with separate kiddie pool, covered hot tub gazebo and ocean front deck. Of course, can't forget to mention the tiki bar and sand dunes that lead down to the waters of the Atlantic. Other upgrades this year include 2 new HVAC systems. This is a great rental property with advertised rents in 2017 listed at $187,427 and over $170,000 in 2018 with several owner weeks being taken. Already 21 weeks booked for 2019 grossing over $156,000. 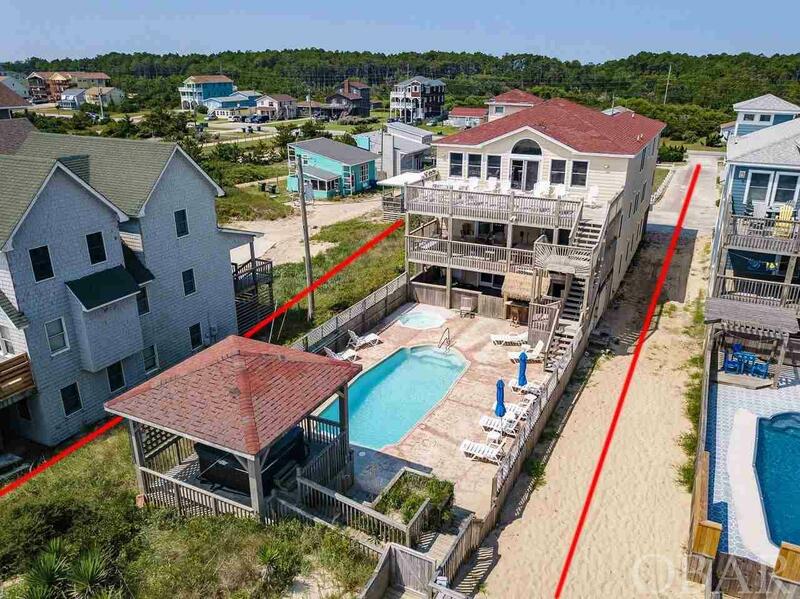 CHECK THIS PROPERTY OUT, VIEW THE VIRTUAL TOUR VIDEO AND AND GET THE FEEL OF "OBX ATTITUDE" AND WHAT IT CAN DO FOR YOU.